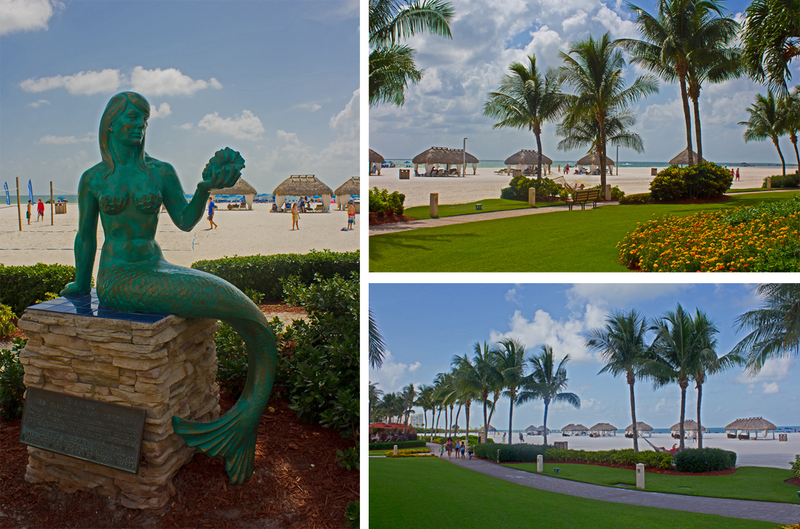 Paradise is a word that comes to mind when trying to sum up my past weekend at the picturesque Marco Island Marriott Beach Resort. 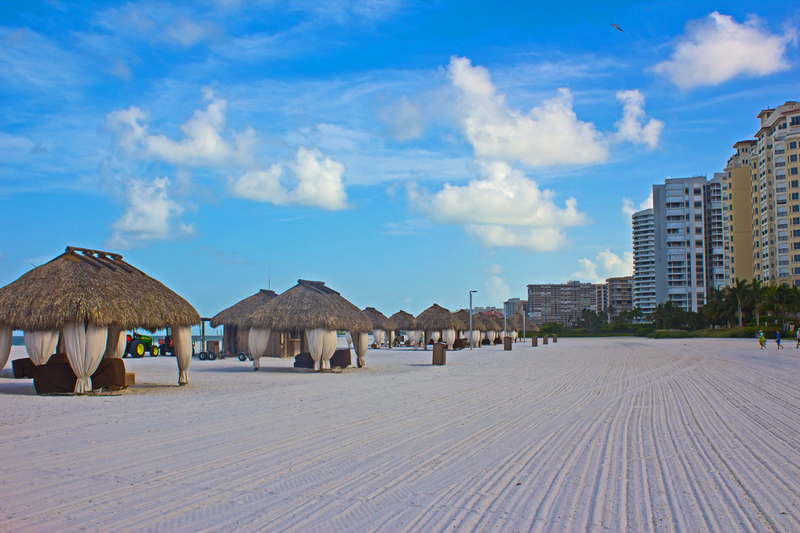 This was my first time visiting the resort and Marco Island, and two days simply was not enough; I’m already having withdrawal symptoms! Overlooking the Gulf of Mexico, the 732-room and 63-suite beachfront resort completed a $225 million renovation and redesign back in 2009 to give it a Balinese-style look and feel. 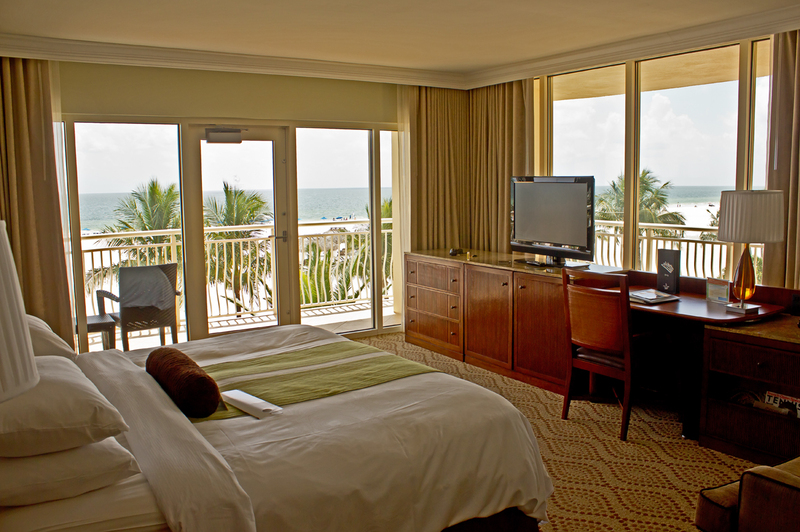 The resort itself is stunningly beautiful and offers pristine views of the gulf from virtually anywhere within. 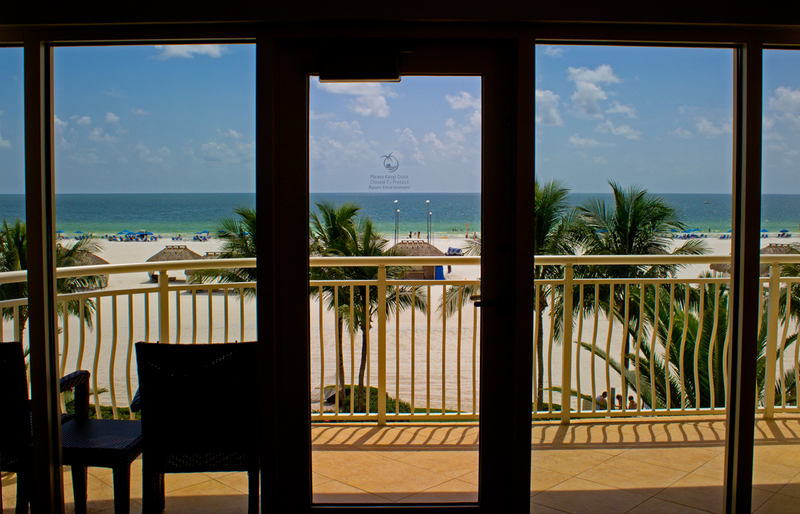 Front-door access to the Marriott’s private stretch of three and a half mile white sand beach, doesn’t go astray either. We stayed in room 326 and what a treat it was! I could not believe my eyes when I saw we had a corner-suite with a huge, wrap-around balcony directly overlooking the beach and one of the pools; it was breathtaking. The room was extremely spacious and offered one king bed, a desk/chair work station, a couch area, a mini fridge and a separate snack/drink bar fridge, two areas to hang and store clothing and a huge, open-plan bathroom with a vanity, mirror and sink in one section and then the toilet, shower and another sink in a private bathroom area. 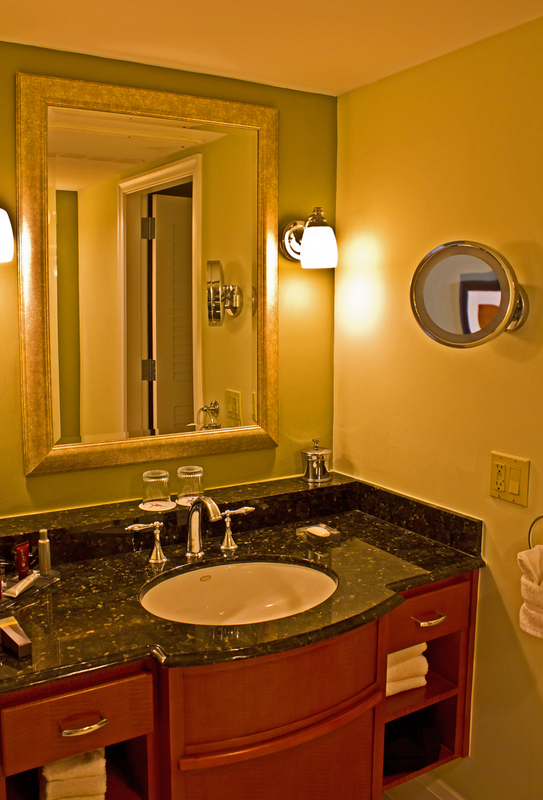 The separation of these two areas made showering and getting ready with two people a breeze! One interesting thing to note – we had a hotel staff member come around to our room at night to ensure we’d fully closed our curtains. Turns out, from May through October it’s turtle nesting season on Marco Island. The Loggerhead Sea Turtle is listed as a protected species by the State of Florida and the Federal Government so all guests are asked to close their black out drapes by 9pm and ensure all lights are turned off if not in use. When I was younger, I used to judge a hotel based on how awesome its pool is. If I applied this same principal to the Marco Island Marriott Beach Resort, then it ranks as one of the best hotels I’ve ever stayed at! 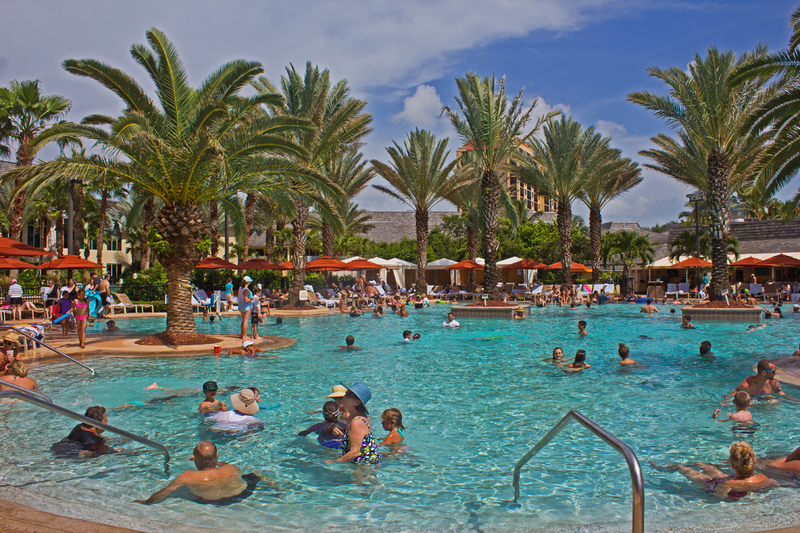 The resort has two main pools to choose from; the Tiki Pool and Quinn’s Pool. The Tiki Pool definitely has a more kid-friendly atmosphere going for it with a waterfall, water slide, wading pool and play and spray area. There were way more children than I could count, so we spent a majority of our time over at Quinn’s Pool. 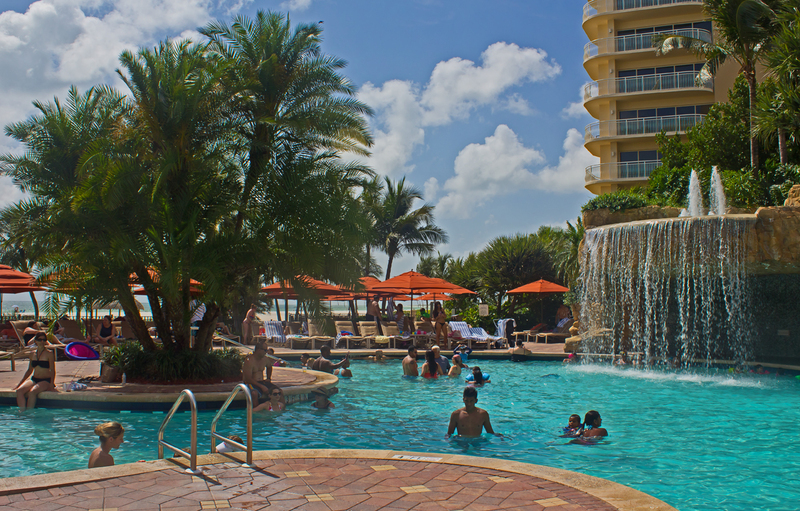 This one is a more adult-centric pool area (although kids are still allowed access), with plenty of umbrellas, lounge chairs (free) and cabanas (for rent). Quinn’s Pool has a very chill vibe going and is the perfect place to lay out and cool off if you’re not a fan of getting all salty and sandy! There are also three hot tubs on property. I dipped my feet into one but given it was 85F out with a real feel of 99F, the water was just too warm to commit to. 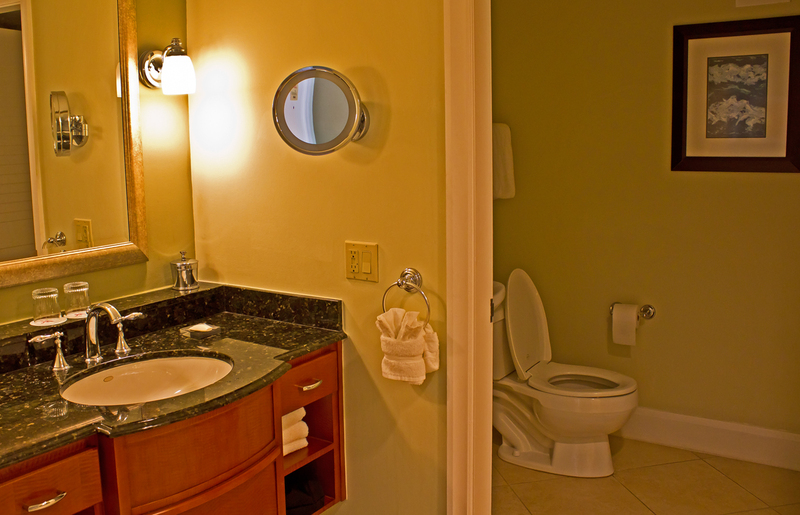 The resort provides front-door access to the Marriott’s private stretch of three and a half mile, white sand beach. Beach chairs and umbrellas are offered and can be requested at the shack on the beach directly opposite the resort. We were told to just go find ourselves any chairs/umbrella that looked unoccupied and claim it, so we did. 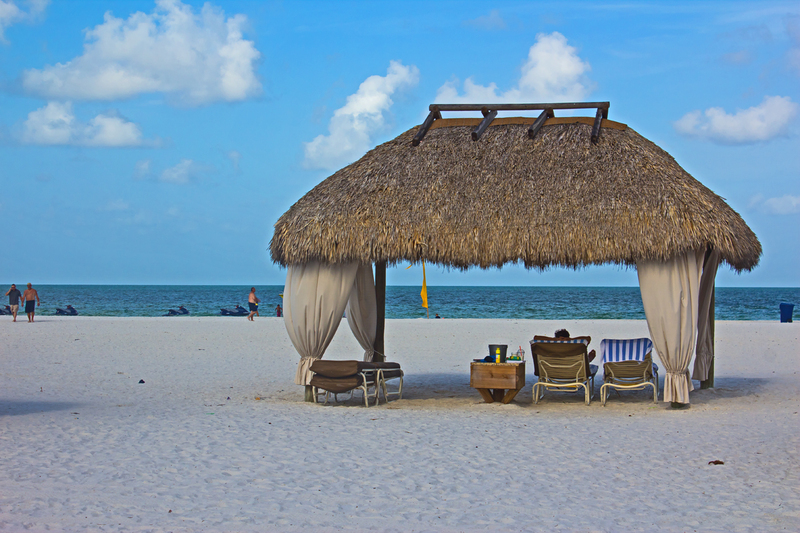 There are gorgeous beach cabanas too that can be rented for a fee. If you want to guarantee yourself a beach cabana for the day, I recommend booking in advance, they were quite popular. The beach is very shelly but comfortable and safe enough to walk around barefoot. 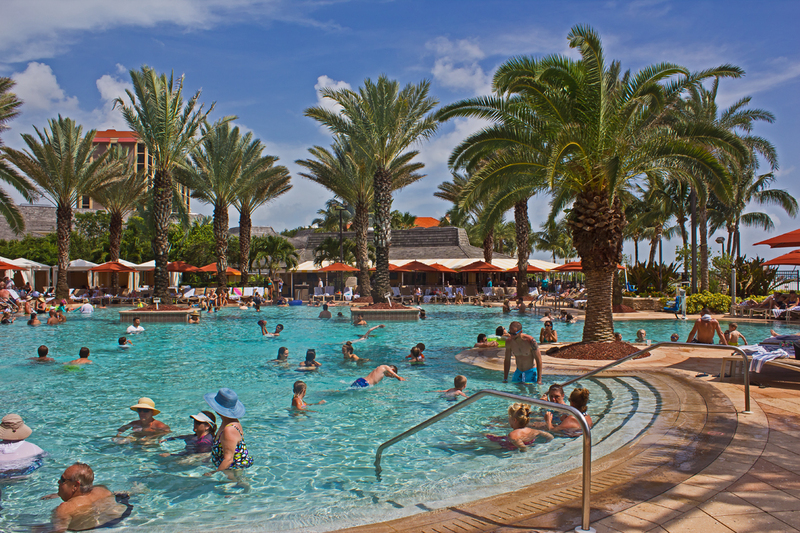 In fact, the resort runs shelling excursions for anyone who is interested. We also noticed that they rake down the sand along the beach regularly too which was nice. 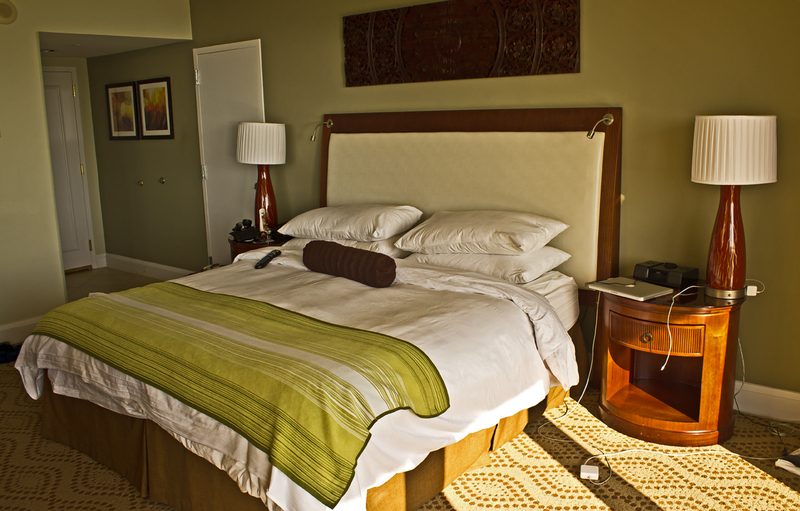 After check-in, you will find an activity pamphlet waiting for you in your room. The pamphlet lists out activities, locations and times for that week. The activities are targeted at both adults and children and range from parasailing and shelling right through to yoga and family bingo! There’s also a nightly Sunset Celebration on the beach in front of Quinn’s. The resort fire-dancer performs as the sun sets on the horizon, celebrating yet another day in paradise. This is a nightly performance that takes place around sunset (during the summer time, that’s around 8:15pm). You can view the latest activity pamphlet times and updates here. 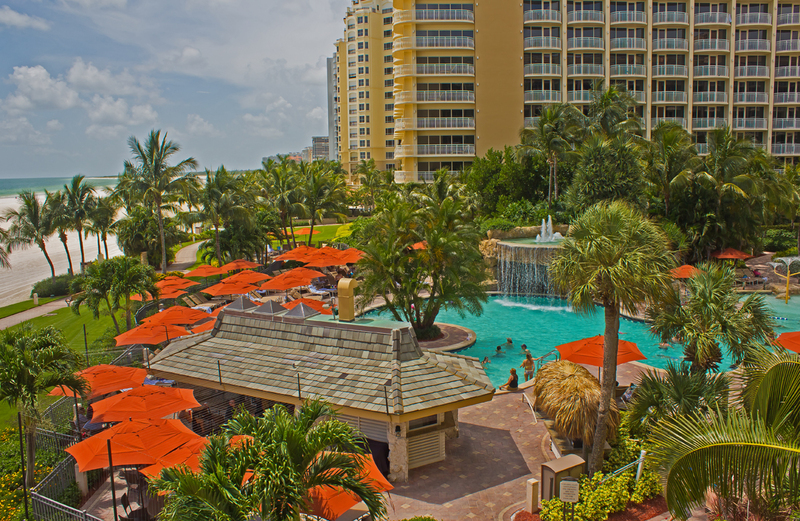 There are five main on-site restaurants at the Marco Island Marriott; Quinn’s, Tropiks, Kurrents, 400 Pazzi’s and Korals. Kurrents is the finer dining option of the five and we decided to dine here on our Saturday night for dinner. Their menu mainly comprises of seafood, steak and creative Florida cuisine with a Pan-Asian flare. Although being a signature dining restaurant, the atmosphere at Kurrents is pretty laid back and they allow casual resort attire to be worn. We chose to sit at the bar overlooking the kitchen. It provided us with a view you don’t really get to see too often in a restaurant and it was fun watching the chefs prepare everyones dinner. It’s amazing seeing how many meals they are putting together simultaneously! When you open up the Kurrents menu, the first thing that greets you is a flash of bright, white light! The menu is backlit and probably the most visually appealing menu I’ve ever come across. Being a nerd, I quite enjoyed this. After having been trying to stick to the paleo diet for the last few months, Kurrents bread basket stole my heart and I decided to indulge. There are few things in life better than good bread and butter. 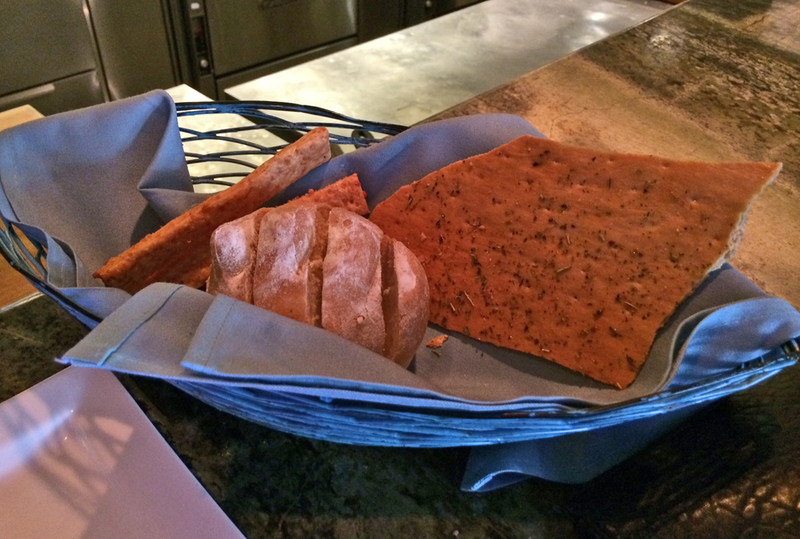 Three types of bread were offered; cheesy, flaky bread sticks, a thin, crisp herb and oil-brushed bread and then a small, crunchy sliced white loaf. All three were delicious and I basically inhaled them on my own. 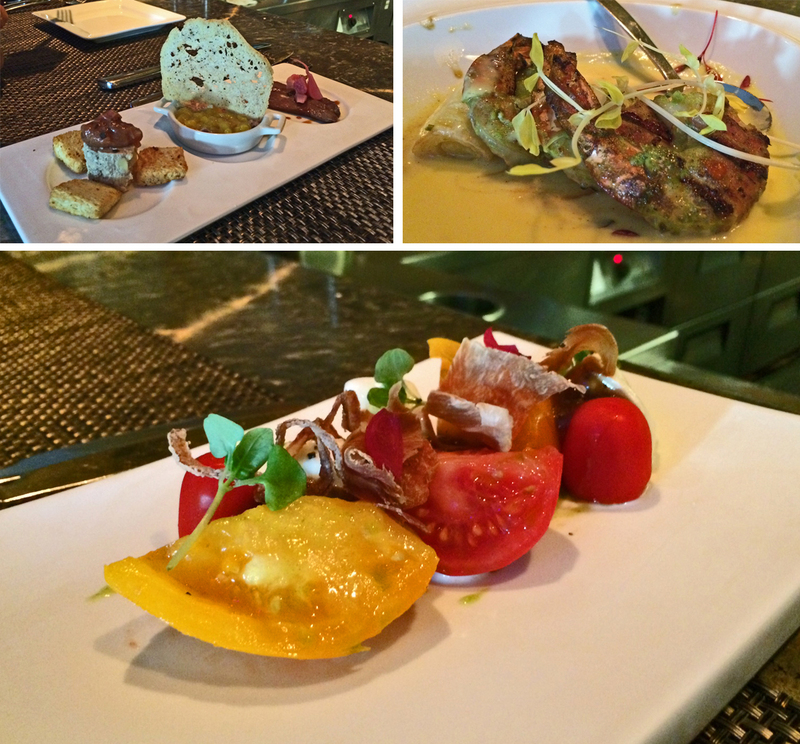 We began with three appetizers; duck three ways, pancetta wrapped Gulf shrimp and heirloom tomato & mozzarella salad. The duck was interesting, the pulled duck was my favorite of the trio. The shrimp were OK but a little over cooked and chewy, and the tomato and mozzarella salad was basic but tasty. 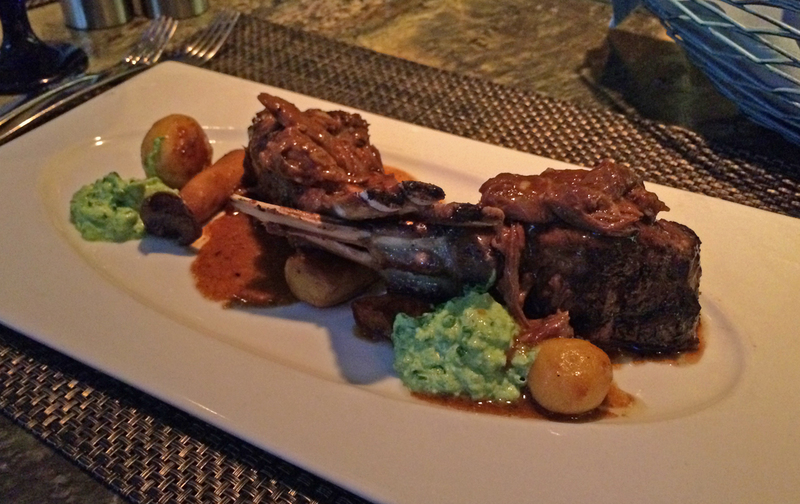 For our mains, we ordered the lamb chops and bone-in Ribeye with potato royal. Being an Aussie, I’m very particular about my lamb, but this dish did not disappoint. 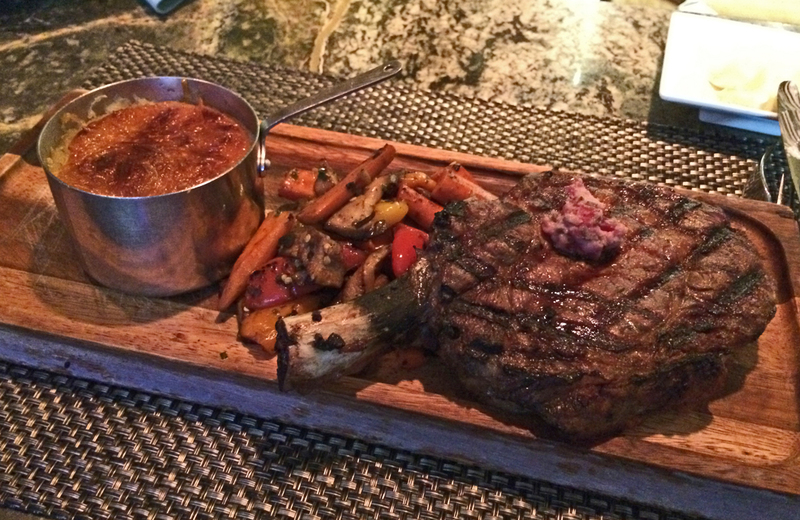 The ribeye on the other hand left me a little sad. I ordered it medium-rare and after cutting into it to enjoy my first bite, it was still red-raw. We had to have it sent back for extra cook time, but by the time it came back to us, my guest had already almost finished their main dish. The upside to my dish; the potato royal. It’s a small pot filled with mashed potatoes and the top is smothered in melted cheese. The mashed potato was definitely amongst some of the best mashed potato I’ve ever had – yum! The Marco Island Marriott staff were some of the nicest I’ve ever come across. They were always happy to be of service and help us out when we had any questions or concerns. You could tell they genuinely loved their jobs and interactions with hotel guests. It’s always nice coming back to a welcoming, smiling face after a long day out in the sun. 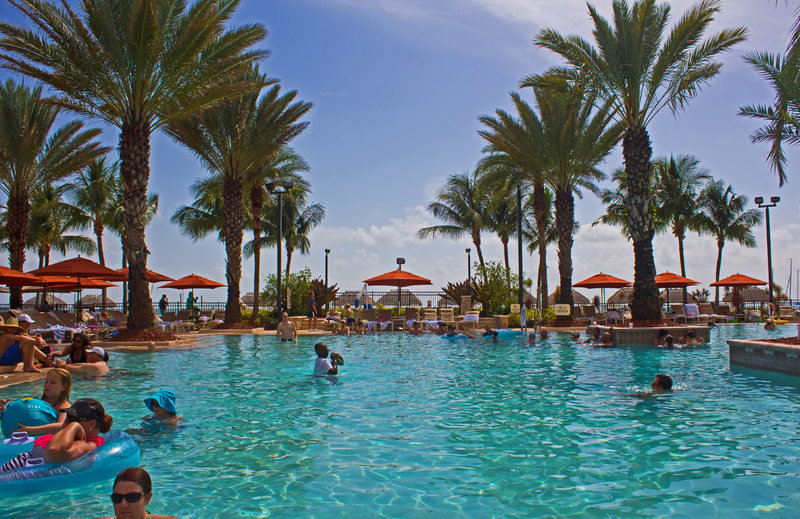 We had a fantastic stay at the Marco Island Marriott Resort – my only complaint is that we didn’t stay long enough! 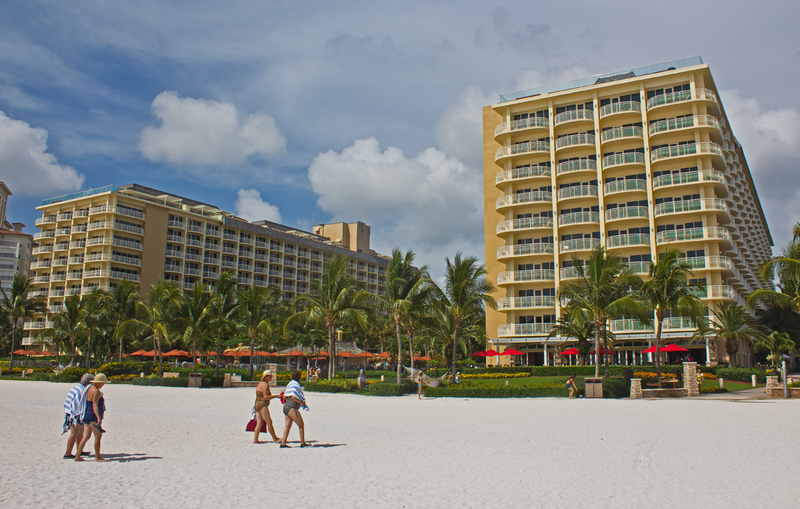 If you ever find yourself in Marco Island, this is definitely a resort worth staying at! 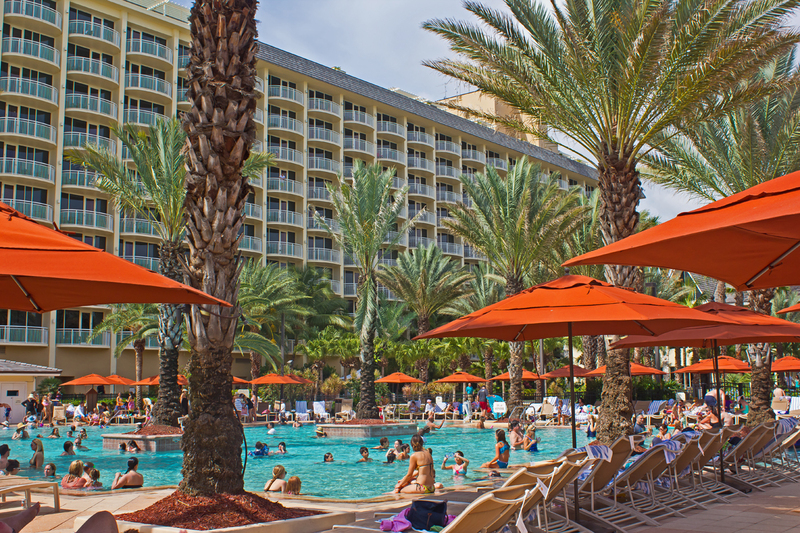 *Marco Island Marriott Beach Resort, Golf Club & Spa kindly gave me a complimentary room and dining credit for my stay, but all opinions are my own. Amazing views of the room! haha i love how you gauge a hotel’s awesomeness by its pool — i do that sometimes too 🙂 Very interesting about the turtles and how all hotel rooms’ curtains must be closed! I guess the turtles need it to be pitch dark to approach. Yeah, the room was incredible! Haha, hotels that had lazy rivers or wave pools used to score bonus points! this place looks incredible! i didn’t even know it existed, so THANK YOU. Oh man, this place looks AMAZING! I’m definitely going to have to add this to my list of places to visit! Thank you for all of the incredible photos as always, Lynda! Thanks Danielle 🙂 Definitely check it out – especially since your blog is everything Florida!!! That balcony… Yes please!! The beaches look amazing too! 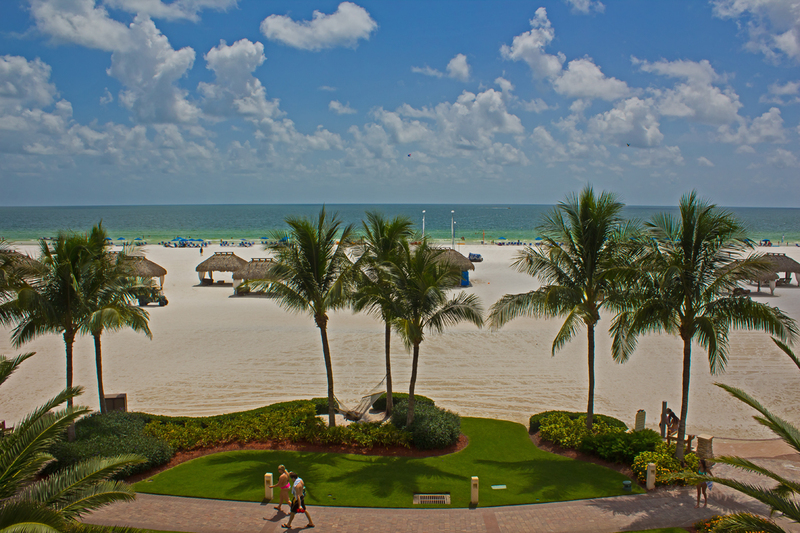 Looks like I need to make a trip to Marco Island soon! 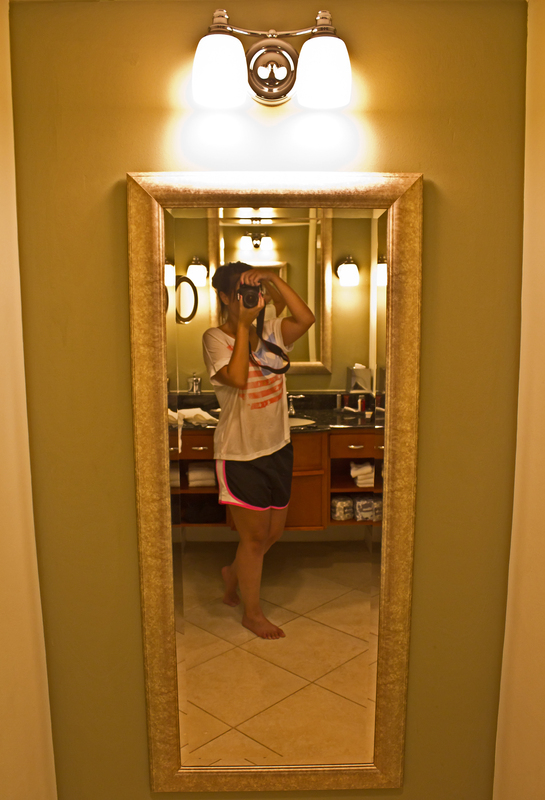 Great review and amazing photos, Lynda! Looks like you’ve covered everything in this post. It’s hard to take a bad photo when the resort looks that amazing! Wow, this place really does sound like paradise! The views are to die for and the food looks amazing too! Scarlett recently posted…Yoga is absolutely not for pussies. It WAS paradise! I want to go backkkkkkk. Who knew that paradise was only a few hours away from home? I definitely want to go here before the cold comes back! hi there thanks for share this idea. i have very enjoyed on written your post. That’s such a beautiful resort. I like those palm trees around the swimming pool. Cool stuff!